Most of the Secret Wars tie-ins based on previous stories and events take one of two paths. Some, like Inferno, tell a "What If?" story to take the concept in a new direction. Others, like Infinity Gauntlet, use the title and a few elements but do something otherwise unrelated. The exception to this rule so far has been Wolverine: Old Man Logan, a wise move considering that the original storyline was set up to have sequels. Mark Millar's "final Wolverine story" is probably the best thing I've read from him if only because of the potential in the concept. It seems I'll have to start reevaluating my statements about not enjoying post-apocalyptic stories, because this, Weapon Brown, Wasteland, and Age of X and have all surpassed what I see as the genre's limitations. At times Old Man Logan and Weapon Brown seem to have the exact same plot, but that's primarily because they're both riffing on Mad Max. Where Weapon Brown uses classic characters to lampoon various genres, this comic uses them to make the emotional beats hit much harder. Having the inbred descendants of the Hulk be the horrible landlords of Logan and his family is an effective shortcut compared to inventing new characters and trying to imbue them with menace. It's been fifty years since the supervillains took over after a mass superhero massacre; in retrospect it's the same conceit as Millar's Wanted without the idea that our world is a result of these events. If you want to get a little inventive with the timeline, it's quite possible that the world of Old Man Logan branched off at the Acts of Vengeance crossover. Only a few details -- like the Sentry's sigil appearing on a flag -- work against this. There's a lot of suspense built up around what caused Logan to end his career as Wolverine and what his role was in the supervillain takeover. Although the lead-in to the reveal is still powerful, I'm going to not spoil the big secret and let you find out what it is for yourself. One of the major reasons why Old Man Logan seemed to demand a sequel was because the original had a detailed map drawn up of the apocalyptic USA. The narrative only visits a few places, so there's lots of room for the new title to explore. There are story segments that we don't get to see that take place in cities like Paste Pot Creek. Even before the story begins, the map conveys the sense that a lot has occurred in the fifty years. Territories have shifted from villain to villain; the Hulk took over the Abomination's land, while Magneto eventually succumbed to age and left a power vacuum in Las Vegas behind. It falls to Hawkeye to instigate the journey across the United States that takes Logan away from home. Logan needs to get money to pay the Hulks' rent since he refuses to bare his claws for any reason; Hawkeye's delivery mission is a little more ambiguous. That part of the journey becomes a shaggy dog story towards the end, and Hawkeye exits the story with a mixed effect on the narrative. He's a great character on his own, but the notion that he married Spider-Man's daughter is just ... weird. It's not a particularly effective plot point since Spidey is long-dead and the math doesn't add up. If it was just to get the Spider-Mobile involved in the plot, then it would've been easier to have them steal it. Steve McNiven is a huge boon to Old Man Logan as he is able to depict the awful future of the Marvel Universe with shocking detail. I'm glad I read this in guided view on Comixology as I would have missed some great facial expressions and setting elements otherwise. My favorite are the words "the vermin have inherited the Earth" scratched almost imperceptibly on a truck in a background panel. McNiven is the kind of artist who draws every rock and every shard of glass that resulted from an explosion, and this captures much of the mood that Millar is conveying with the story itself. There's a lot of gore, but it's a story that honestly deserves that much bloodshed, even if some of the deaths are fairly ridiculous. There's been talk of Wolverine: Old Man Logan being adapted into the final film for Hugh Jackman's version of Wolverine. If that's the case, I would wholeheartedly support it as Old Man Logan feels like Millar wrote it as a screenplay first. The recent release of Mad Max: Fury Road has proven to me that post-apocalyptic fare doesn't have to be utterly brainless; while I haven't seen it yet, it's very rare that such a film would even pique my interest or generate such debate online. 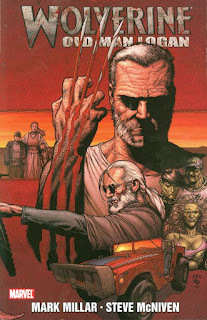 Perhaps they could even cut out the middle-man and have George Miller direct the adaptation of Old Man Logan ... although I dread the kind of restrictions Fox would likely put on such a project. One thing is for certain: as the teasers for the All-New, All-Different Marvel Universe have demonstrated, Old Man Logan isn't going anywhere soon, and I'm excited to see what's in store. Next week, I'll continue my look at inspirations for the various Secret Wars tie-ins with another classic, Neil Gaiman's Marvel 1602.